Skype remains the most used in terms of voice-over-IP! If you want to keep a recording of your conversation on Skype, you can try iFree Skype Recorder. You can have details of its main features below. 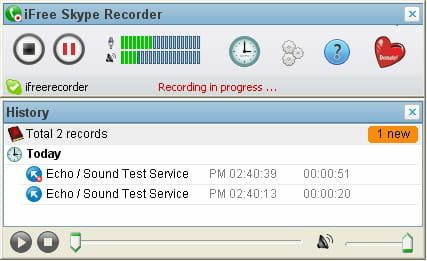 Custom recording: once you have downloaded and installed iFree Skype Recorder on your computer system, you can then start recording any Skype conversation. You are given the possibility to do it automatically or manually. Recording: iFree Skype Recorder can record any types of calls. Indeed, you can record a Skype to Skype call, Skype Out and Skype In calls as well as Skype Conference with multiple participants. Output formats: after the recording, you can save it to MP3 format using Lame MP3 encoder. After that, you just have to select the target folder in your hard disc to save the file. MP3 player: iFree Skype Recorder is also built-in with an MP3 player. That way, you can easily listen to the MP3 file, with basic options such as Mute, Play, Stop and many more. iFree Skype Recorder is totally downloadable for free. It is quite easy to use thanks to its intuitive interface. Latest update on July 2, 2013 at 08:40 AM.